The Big Van has moved people, and people’s pots & pans, plasma screens, posters, pine dining sets, paintings, pot plants and PCs, as well as photocopiers and filing cabinets. We’ve provided removal services to people across London, and we’ve moved them all over the country, and we’ve moved them to Europe. 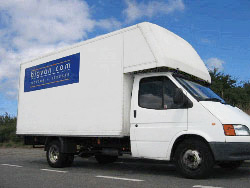 We’ve been helping people make home relocations and business relocations since 1996. Read some of the testomnials from our happy clients.